I am a ‘stuff’ person. There is a very real part of me that envies neat people who seemingly have no use for stuff. Their houses are always so open and spacious; they never have to slide anything out of the way before putting grocery bags on the counter. To visit homes like these is a treat for a few hours or even days – to take in all the room and see how easy it is for them to maintain a clean table or sweep the kitchen floor. But I will never be one of these people, and for the most part, I’m OK with that. Sure, it takes me 20 minutes to move all my things off the bathroom vanity so I can wipe it down, but those candles and lotions and knickknacks are more important to me than the blank space they take up could ever be. I’m simply a stuff person and I was raised by stuff people and I feel blessed that I now have much of their stuff to remember so many good times by. The stuff I’m feeling most lucky to have right now is Christmas ornaments. My mother’s collection of Christmas ornaments reads like a diary of her life. There are handmade ornaments she was gifted from crafty work friends and family members, ornaments honoring my and my siblings’ births, ornaments we made as children in school, ornaments from our first trip to Disney World and every trip thereafter. And many, many more. Each year, when decorating the Christmas tree, we would first string up the lights, then between the rows of lights hang the red beads, then get to unwrapping each of the ornaments. Once all the ornaments had been hung, it was time to fill in any space (of which there was little!) with shiny Christmas balls. Then, as if it simply wasn’t enough, we got about the very important business of hanging popcorn balls and candy canes. And while all the ornaments stayed just where they were until the time came to take the tree down, the popcorn balls and candy canes always disappeared almost as quickly as they could be hung! When I was young, the only candy canes you’d find were peppermint candy canes. Perhaps there were other flavors, but I don’t remember them if there were. And to this day, peppermint candy canes are the ones I most often choose to decorate my Christmas tree. I love the look, I love the colors, and I love sneaking them off the tree to eat them just as much as I ever did! My appetite for popcorn balls hasn’t wavered a bit, either, and while the packaging may have changed, the taste thankfully hasn’t. 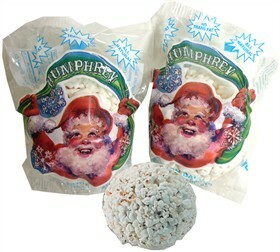 Each year I go about the business of hanging at least 15 Humphrey’s popcorn balls on the tree, each with a smiling Santa on the wrapper. And each year if I turn my back on my husband for one minute, 15 popcorn balls becomes 14! We won’t even get into how many candy cane wrappers can be found next to his chair. But that’s more than alright by me as it speaks to the power of the season. No matter how serious or busy or overwhelmed we may be in our day-to-day lives, there’s something oh-so-special about coming home to a tree right in our own living room – a tree full of glimmering lights, shiny beads, priceless ornaments, and the perfect snacks. Even if I have to replace those candy canes and popcorn balls a dozen times before Christmas, I stand by my belief that the ones picked from the tree taste better than the ones in the bowl. I think Christmas trees just might be a bit magical, or perhaps, more than a bit. 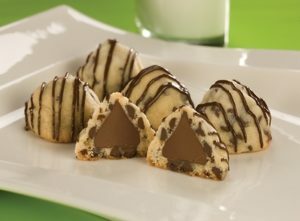 Christmas Cookies with Hershey’s Kisses – Santa-worthy Sweets! A friend once told me that it was scientifically proven that the cutest thing in the world was a baby riding a puppy. That someone – somewhere – had done a cuteness study, and with puppies and babies being the cutest of the cute, the combination tipped the scales for the two to share the cute gold. Now, I don’t know if this is true, but it’s one of those fun ‘facts’ that I’ve heard and like to share, so I almost don’t want to know if it isn’t. Because you know what? I can’t think of anything cuter than that. So at least for me, I already have my scientific evidence! Where am I going with all this talk of puppies and babies? Believe it or not, it’s my lead-in to talking about cookies and candy! Just as I can’t think of anything cuter than puppies and babies, I can’t think of anything tastier than cookies and candy. And applying the same scientific logic researchers somewhere may have applied to the baby and puppy combination, I’m going to have to say that while candy and cookies are delicious all on their own, they’re even better together. 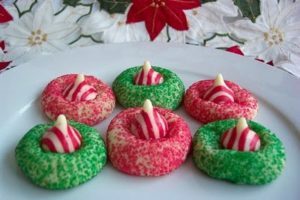 Candy Cane Kiss Cookies – Combining Hershey’s Candy Cane Kisses with sugar, butter, vanilla, and other yummy goodness creates some of the most colorful Christmas cookies I found! These also look fairly easy to make, so I’ll be keeping the recipe handy for those days I want a fresh-baked treat but am not in a baking mood, or am pressed for time. 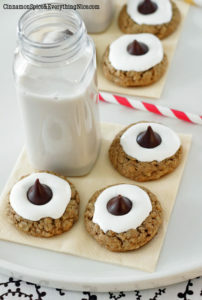 Hershey’s Kisses in the Middle Cookies – I am a huge fan of peanut butter cookies with Hershey’s Kisses nestled into the top, but while I was searching for the best recipe for those, I found these! In my cookie-eating experience, it is usually the lumpy, bumpy cookies that taste the best, packed with chocolate chips, dried fruit bits, and all manner of yum for my tum. But I would never expect there to be a whole Kiss inside, and if I wasn’t prepared for it, I might just cry happy tears. Right there. At the dessert table. Happy, happy tears! Oatmeal Kiss Cookie S’mores – Oh my goodness. These Hershey’s Kisses topped cookies stopped me right in my cookie-searching tracks. How delicious do they look? So, so delicious. As someone who can’t control herself around oatmeal cookies – seriously, don’t get in my way! – I already know I’ll have to make a big batch of these if my family and friends hope to get so much as a crumb.